Thank you so much for being a part of the 45th Annual Castro Street Fair. It was a gorgeous day in the neighborhood — we danced, we nibbled, we sang, we smiled. The streets were filled with friends new and old, and with the sounds of music and laughter. The sunshine fueled a day of great entertainment! Check out some moments in our Instagram story (“2018” in the highlights). We are filled with gratitude for the love, care, and participation of everyone who attended, performed, volunteered, and donated. Thank you! We are looking forward to announcing our 2018 community donation amounts later this year. If you’d still like to make a donation towards the 2018 cycle, please visit our Donate page — Donations and annual proceeds from the Fair help support plenty of local non-profits within the Castro community, as well as helping with the maintenance of the Rainbow Flag at Harvey Milk Plaza. 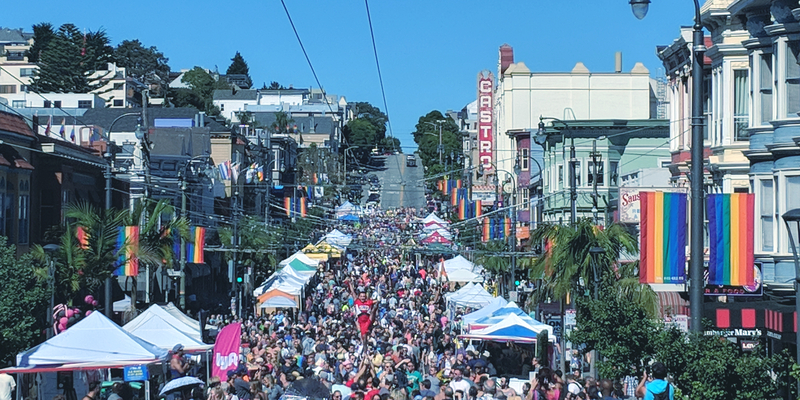 We look forward to seeing you all next year in the Castro, for the 46th Annual Castro Street Fair, on Sunday, October 6, 2019!